September 15 is Ladies Night in Uptown Westerville! Amish Originals is thrilled to again be hosting Uptown Westerville’s 4th Annual Ladies Night! For one night only, we throw open the doors and welcome our wonderful neighborhood merchants and restaurants to visit, share and enjoy time with all of our guests. It’s a great night and we certainly hope you can make plans to join us on Thursday, September 15 from 7-9pm. This year, we are really asking for some extra help for WARM’s food pantry – so please, please bring cake, muffin or brownie mix or frosting as your admission fee for the event! 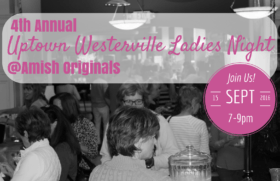 Confirmed vendors include: 8 State Bistro, Asterisk Supper Club, Edwin Loy Home, A Twist on Olives, Lulu’s Sweet Shop, Pure Roots, Buckeye BrewCraft, Morgan’s Treasure, Cinda Lou, Zen Kidz Play Café and Blue Turtle Tea & Spice on Main. We will also be serving wine and a special cocktail for the evening, courtesy of Svedka Vodka and lots of raffle prizes for all our guests. Grab a friend and we’ll see you on the 15th!